* If you're interested in the Monday Open Studio Online, click here. How does the Monday Open Studio work? The Open Studio is a full day of painting as we paint for six hours, from 9:00 am until 3:00 pm. I will always have something selected in advance to paint. I'll have photo references so you can paint along with me. I will demo the painting and I'll spend time with each of you and provide as much instruction as you want. If you want very specific detailed palette knife painting then please join me for one of my workshops. The fee is $100 for the six hour painting session. I provide easels and glass palettes. You need to bring palette knives (although I have these too), canvas or canvas boards, oil paints, paper towels, etc. For a list of the supplies, paint colors and canvas boards I use, check out my workshop supply list. You will need either an Ampersand canvas panels or stretched canvas (for large format classes) for every session. I typically use a 12" x 12" and 11" x 14"(1/8" thick) but each class already lists what size you will need. Also, if you have an ipad, please bring it! When and where is the Open Studio held? 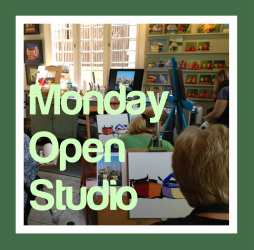 All open studios are on Mondays and the session is from 9:00 am - 3:00 pm. Please bring a lunch as we will take a quick lunch break. The schedule is posted below. It's really important that you arrive a bit early as we will start promptly at 9:00 am. If you are late then it makes it hard to catch up! Sign up by following the link REGISTER HERE. Each session is limited to 8 artists. Please email me if you have any questions. Since class size is limited to 8 students you should always register in advance. Unfortunately once you sign up there are no refunds. If you need to change your dates, you can change to another class 14 days prior to the class. Changes cannot be made less than 14 days in advance of your class. Jan 26 - Painting Florals - Abstracted large format! Jul 13 - Painting Boats - large format! Nov 16 - Painting Florals - Abstracted large format! Sign up using the tab above titled REGISTER. Select the date and session and enter your information.